Mr. Clavijo took the reins of the New England Revolution in 2000. When the New England Revolution announced in November 1999 that Fernando Clavijo would become the team’s new head coach, he stressed the importance of being forthright. Mr. Clavijo, who was 63 when he died Friday in his Fort Lauderdale, Fla., home of multiple myeloma, guided the Revolution to its first playoff victory in the team’s five-year history during his first year as head coach. He also led the Revolution, which is owned by the Kraft family, to the US Open Cup finals. During Mr. Clavijo’s tenure, he was the team’s first coach to complete two full seasons, before he was fired in May 2002 after a string of losses. Even then, he remained forthright. Mr. Clavijo’s death was announced by FC Dallas, the team he had served as technical director until stepping down last fall because of failing health. 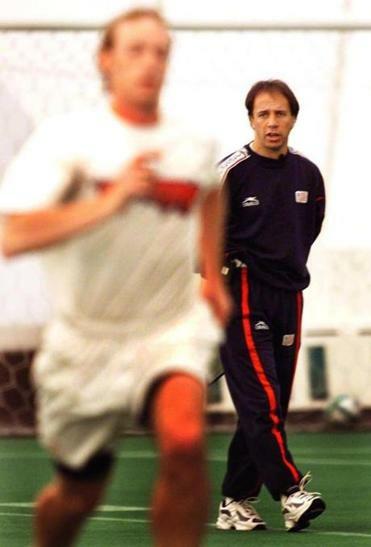 An immigrant from Uruguay, Mr. Clavijo had been a starter for the 1994 US World Cup team before beginning a lengthy coaching and management career in Major League Soccer. He made 61 appearances for the US national team from 1990 to 1994, mostly as a defender, and was inducted into the US National Soccer Hall of Fame in 2005. Born in Uruguay, Mr. Clavijo told the Globe that he began playing soccer while growing up in Punta del Este, a beach resort in the state of Maldonado. He said in a 2001 interview that his father, Martin, was an accountant for the city and that his mother, Irma, was a nurse. Mr. Clavijo rose from street games and organized leagues to turn pro at 16 for the Atenas club in San Carlos, Uruguay. In 2001, he recalled that a couple of years after marrying, he and his wife, Martha, moved to the United States not so that he could pursue soccer, but for a better standard of living. He got his first break as a player with American Soccer League’s New York United, based on Long Island, N.Y., where he and his wife supplemented his playing income by working at a restaurant. Mr. Clavijo then played for the New York Arrows of the Major Indoor Soccer League. From there, he moved to the San Jose-based Golden Bay Earthquakes of the North American Soccer League, and then to the MISL’s San Diego Sockers. With the Sockers he won five league titles to augment the two he had won with the Arrows. He went on to play with the Los Angeles Lazers and the St. Louis Storm. Mr. Clavijo became a US citizen in 1987 and debuted for the US team in 1990. He played for the team in the 1994 World Cup, including a 2-1 win against Colombia at the Rose Bowl in Pasadena, Calif.
Mr. Clavijo started his coaching career in 1991 as a player-coach with the St. Louis Storm of the Major Indoor Soccer League. After his playing days were done, he coached the Seattle SeaDogs of the Continental Indoor Soccer League (1995-97) and the Florida ThunderCats of the National Professional Soccer League (1998-99). He also was an assistant coach, first with Nigeria at the 1998 World Cup and then with MLS’s New York/New Jersey MetroStars in 1999, before beginning his tenure as the Revolution’s head coach with the 2000 season. After the Revolution, he led Haiti’s national team from 2003 to 2005 and coached MLS’s Colorado Rapids from 2005 to 2008. His final coaching stint was with Miami FC of the second-tier NASL in 2009. During his tenure in Dallas’s front office, the team finished with MLS’s best regular season record in 2016, when it won the US Open Cup. “If a player is destructive for the rest of the team, I will have no reservations to move them out,” Mr. Clavijo told the Globe in August 2005, when he was coaching the Colorado Rapids. While coaching teams, as was the case during his years playing, he focused on the ultimate goal. Complete information about survivors and a memorial service was not immediately available. The Associated Press reported that Mr. Clavijo leaves his wife, Martha; their sons, Nico and Jonathan; and two grandchildren.